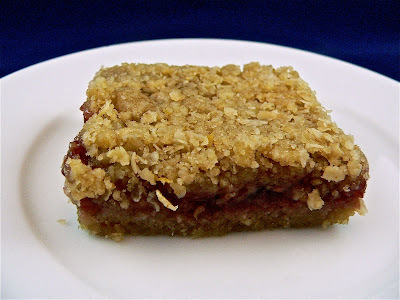 BOSSY BETTY: Raspberry Jam Bars! 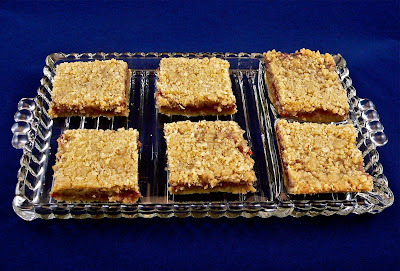 If it's Wednesday, it's time to make Raspberry Bars! I whipped a pan of these the other night and had some very happy vegans and non-vegans alike. These suckers are seriously good. Begin baking now for a brighter tomorrow! 1. Heat oven to 350° F. Place the flour, sugar, salt, baking soda, and butter in the bowl of a food processor and pulse several times until the ingredients are combined and a crumbly dough is formed. Add the oats and lemon zest. Pulse quickly twice to combine. 2. Press 2/3 of the dough firmly into a greased 9-by-13-inch pan. Spread the jam evenly over the crust. Sprinkle the remaining dough over the jam, gently pressing down. 3. Bake until golden brown, about 20 minutes. Cool completely, about 2 hours. Cut into 24 bars. Store in airtight containers or just consume all of them immediately.